Dance Program presents 2017 Spring Dance Concert | Department of Drama, U.Va. The Dance Program of the Department of Drama at the University of Virginia presents its Spring Dance Concert April 20 - 22 at 8:00 p.m. in the Culbreth Theatre. This spring’s concert, in celebration of the 10th year of the dance minor program, showcases not only the work of students and faculty, but also of guest choreographer Rose Pasquarello Beauchamp who was the founding Head of the Dance Minor program at its inception in the fall of 2006. Pasquarello Beauchamp, currently teaching at the University of Rochester, and 2010 UVA alumna, Erin E. Mayfield, returned to the University this semester for a 4-day residency with students in the Dance Program. Mayfield, who minored in dance during her UVA career, went on to receive her M.F.A. in Film and Television and now creates cross-platform film and dance works. Mayfield and Pasquarello Beauchamp are co-founders of SirensProof Films and work together connecting with various communities through art. This past February, the guest artists collaborated in their respective fields of Dance and Film to design and set a new work with seven UVA dancers. They sought to create a piece reflecting upon the current sociopolitical climate in the U.S. and felt it was important to foster dialogue with the dancers in the creation of the work. As a result, the dancers in #ResistanceAnthem were an integral part of the development of this piece, which combines written and found text from the students with conceptual ideas in both dance and film. With an original composition by Jordan Perry in collaboration with three University Singers, Dance Program Lecturer Katie Baer Schetlick’s never blinded by the absence or overabundance, it lets in just enough highlights five 4th-year dance minors. Focusing solely on the physical forces of push and pull, this work muscles through the possibility that dance is not about self-expression or "the body" but instead defined by the surrender of the self and the over-conceptualized body. Here, the dancers move their individual anatomies in an effort to resist concept. 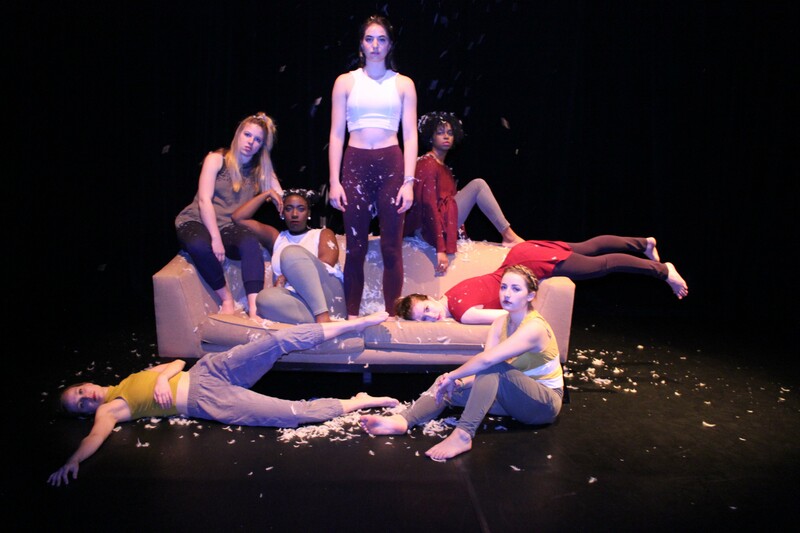 The spring concert also features work by eight student choreographers including 4th year dance minor Naomi Moore, an architecture major with a concentration in design thinking. Her piece I Am Sitting In A Room is part of her final thesis project. In addition to showcasing strong technical and creative dance artists, the spring concert reflects each choreographer’s conceptual and aesthetic interests – resulting in an evening of eclectic, provocative, and engaging performances. Tickets for the Spring Dance Concert can be purchased online at ww.artsboxoffice.virginia.edu, by calling 434-924-3376 or in person at the UVA Arts Box Office, located in the lobby of the UVA Drama Building, open Monday through Friday from noon until 5:00 p.m. Tickets are $7 for adults, $6 for seniors, UVA Faculty/Staff, and UVA Alumni members, and $5 for students. Full-time UVA students may receive one free ticket if reserved at least 24 hours in advance of their desired performance date.